A dreamy romantic weekend in Santa Barbara doesn’t have to be ritzy. Affordable, memorable, adventurous dating ideas are more than possible when you roll like a local. 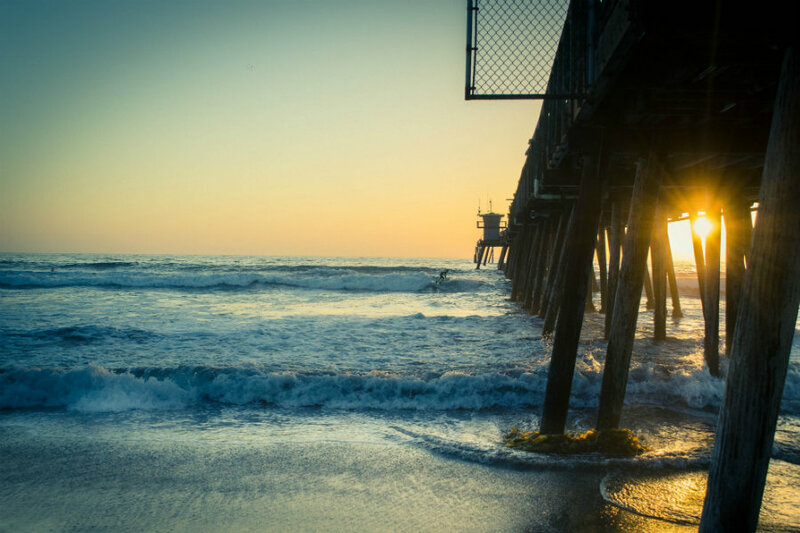 CALIFORNIA – They call Santa Barbara America’s French Riviera. But it's an all-natural glamour. Misty mountains perch over salty beaches, and the ocean creates excitement in the air — it's a treasure trove for outdoor enthusiasts. Like the Riviera, the area's filled with celebrities (Katy Perry, Oprah), but the rich and famous are likely to tuck themselves away in beautiful estates hidden by overgrown eucalyptus trees and mustard flowers. Fortunately, you don't need big money to have a grand time here. For the frugal, the poor, and the collegiate among us, a weekend of riches is in store. It was in this very town that I met and fell in love with the man of my dreams. I was a college student and he was newly graduated and had entered the ministry, so we had to get creative about dating ideas on the cheap. Here are some of the most seriously memorable — and affordable. See if you can spot the hot tub! Photo courtesy of Fess Parker Doubletree Resort. Pizza for two. Photo courtesy of Lucky Penny. For an authentic start to date night, have dinner at beloved , which, despite external appearances (many a Hollywood figure is spotted here), is truly a local gem. For dinner in a neighborhood also worth exploring, check out the picnic tables on the patio of , where artisanal wood-fired pizzas pair with salads of high-quality ingredients. It’s a hip, healthy, and more affordable offshoot of one of the trendiest restaurants in town, . From there, stroll through the , the once functional warehouse district turned, well, funky with artists, wineries, bars, cafes, and more. I don’t want to recommend anything in particular because it’s more fun to discover the eclectic nooks for yourself. The Santa Barbara Farmers Market. Photo by Alaina Haring. 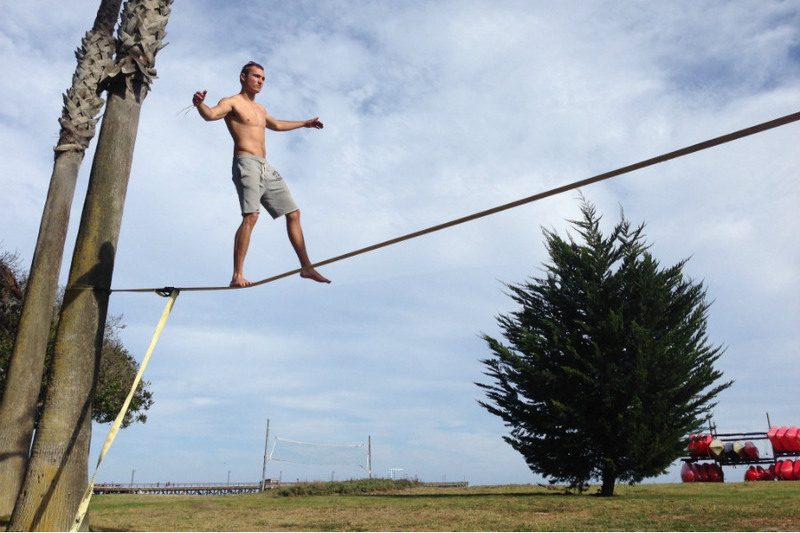 Slack lining in Goleta, across from Adventure Program kayak rentals. Photo by Weston Freels. 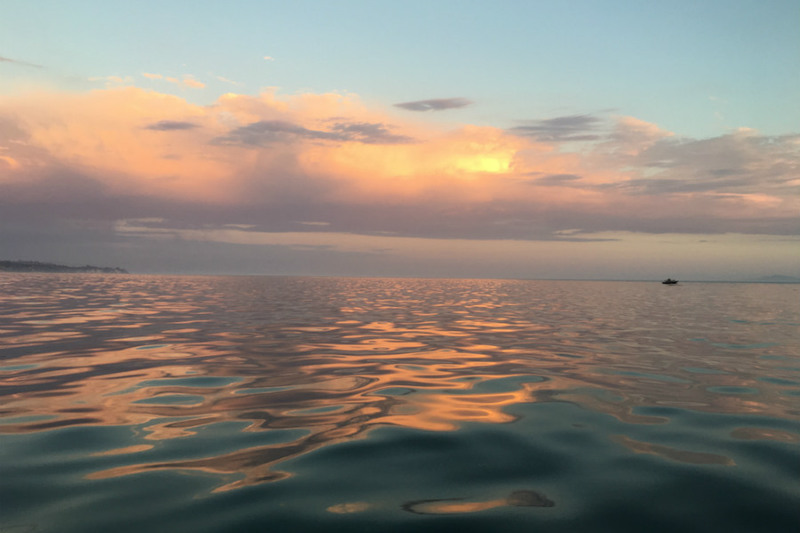 Sunset from the ocean kayaks in Goleta. Photo by Alaina Haring. Goleta Pier. Photo by Ruben Lopez Jr. / Unsplash. In the morning, on Anacapa Street is the place to be for hipster-approved coffee. Parking can be crowded in their small lot, but right around the corner is a larger public parking area where the first hour-and-a-half is free. It's across the street from the , so pick up some produce for a picnic to get you through the next part of your day. Venture over to nearby college town of Goleta, a 20-minute drive on the 101 N. (This is where renting a car comes in handy.) You can hire kayaks by the hour from U.C. Santa Barbara-based . is not only an epic viewing spot by day, but also a great late-night jumping spot — just don’t disturb the fisherman above or the sea lions below (this may or may not be illegal, so use common sense). If you time it right, you can see the bioluminescent phytoplankton phenomenon. Every so often, microorganisms of algae make their way to Santa Barbara. At night, when the waves crash or a swimming fish disturbs the algae, they give off an eerie glow. You will be missing out if you don’t try for dinner: The avocado salsa at their self-serve bar is addictive. The meal will be hardy and satisfying and only a short drive from the beach. Go ahead and revel in the pyramid-shaped rice structures which accompany most dishes. On your way back to Santa Barbara, pop into , a fancy property tucked into the bluffs and overlooking waves crashing into the ocean below. Cheap thrill: If you buy a bottle of wine from the Pool Bar you can access the hot tub. (Yes, you're sensing a theme.) Otherwise, the Bacara gardens are a stunning stargazing spot. Enter through the parking lot by the tennis courts and follow the trail up. Stringing a hammock between the trees at sunset will make you count your lucky stars. East Beach palm trees are perfect for a slack line. Photo by Rachel Carroll. 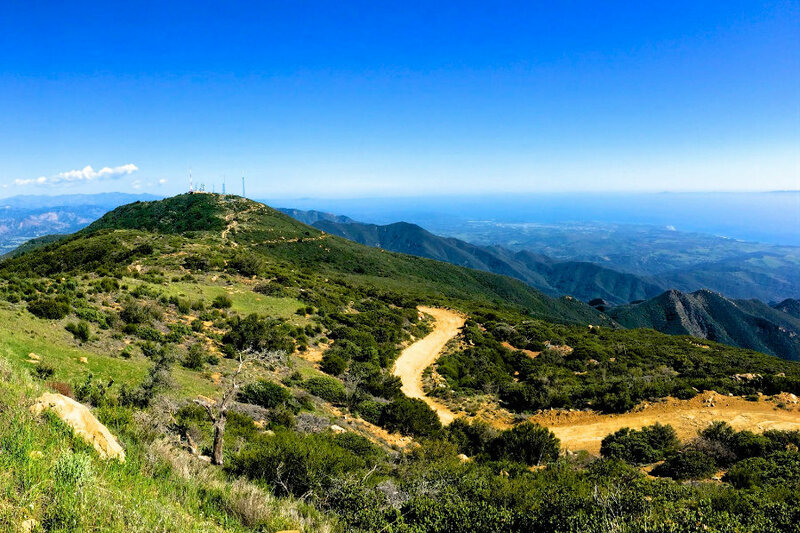 Overlooking the trails of Los Padres Mountains in Santa Barbara. Photo by Weston Freels. On Cold Springs Trail hike, which leads to Tangerine Falls. Photo by Alaina Haring. 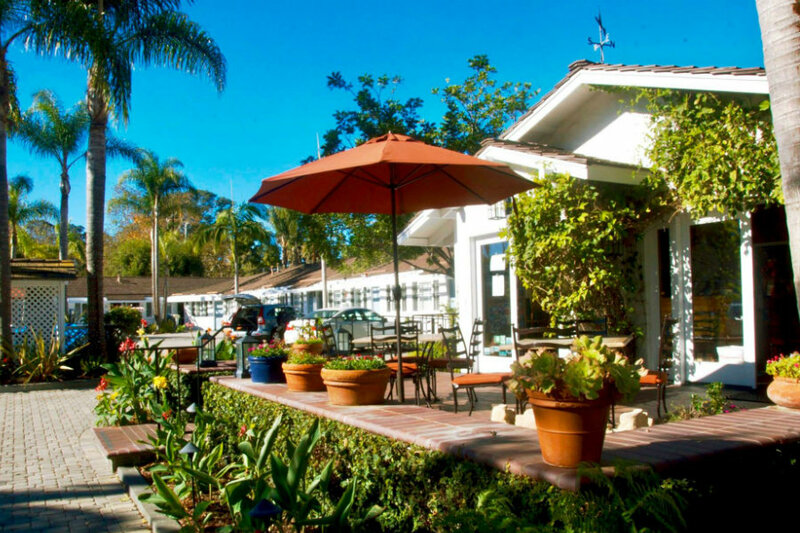 Downtown Santa Barbara is a quirky blend of social classes, cultures, and interests. On one block you’ll find high-end restaurants, clothing boutiques, and snobby art studios; on the next, you’ll find a mom-and-pop Mexican bakery and dollar store. Let's not forget the totally hippie surf shops and and barefoot dudes with dreadlocks. Definitely stop by the downtown location of on Motor Way street, walking distance to the beach. Casual, hip, and healthy, their acai bowls just might spark love. The local tree-huggers and yoga junkies flock to this spot and are sure to provide great people-watching. Prices are not bad compared to everywhere else, and the berry-packed blends provide a boost of energy for your impending adventures. Next, stroll along for the sidewalk every Sunday. Maybe join a pick-up game of volleyball if you aren’t too intimidated by those Santa Barbara beach bodies. Or do as my boyfriend and I do and unfurl your mat for Acroyoga (find a beginner’s flow on YouTube). The palm trees that line the beach provide great posts for a slack line. For a refreshing hike, check out . It is off Cold Springs road, nestled into the hills of Montecito. 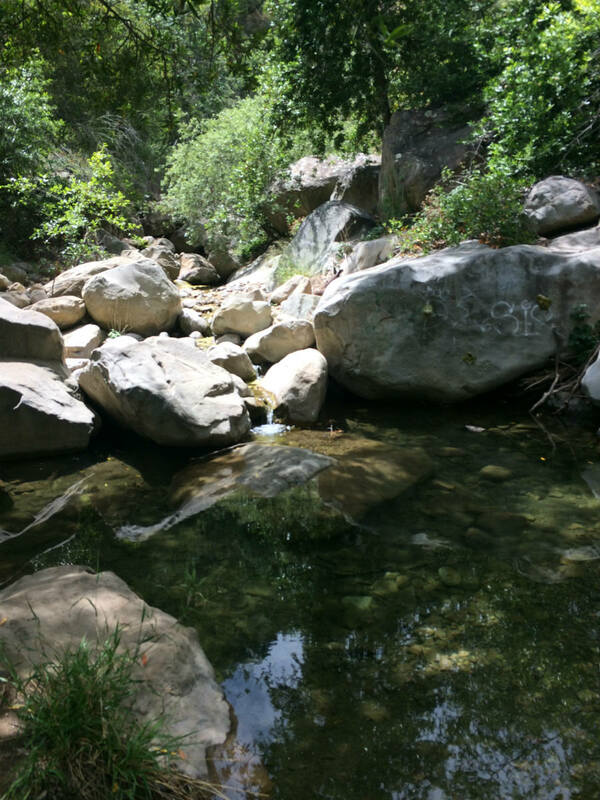 You can take a trail all the way to the top (it's somewhat poorly marked, but just follow the water pipes) or go off the beaten path and climb the waterfall up to a little picnic spot nestled in the rocks — but only do this when the water is not flowing! Remember to wear shoes with good traction. Finish your trip well with the , a local secret (seriously: only share this with nice people, do not mess this up for us) that makes for one of the most unique date nights ever. Fair warning: The two-hour-long drive of bumpy off-roading through the Los Padres mountains requires a sturdy car. Or you could backpack into the hills and sleep at a nearby if you’re feeling those hippie vibes in full force, but check for . Moisturize your skin (and lips!) while enjoying a stone tub of naturally occurring warm mineral water. Candles for ambience are a nice touch. The cute patio out front. Photo courtesy of Marina Beach Motel. How to get there: Though only about two hours north of LA, if you’re not from California, your best bet is to fly into the Santa Barbara airport (SBA). You do not want to drive through LA traffic after a plane ride. How to get around: Though Uber and Lyft have a dynamite presence in Santa Barbara, I’d recommend renting a sturdy car if you want to maximize those mountains and hot springs. But, if you’re sticking to the town, it’s possible to bike everywhere. Plus, the locals will love you for that ecofriendly vibe. What to pack: Anything goes, but no stilettos necessary here. Bring some flowy skirts and flip-flops. Where to stay: blends affordability with cuteness. (Don’t let the word "motel" scare you.) It’s a block away from the beach and a short drive to downtown. With a complimentary continental breakfast and parking access right outside your room, it's a good home base for your impending adventures. Alaina is a California girl, and an editorial intern at Popupla HQ. She travels to connect with new communities and enjoy beautiful adventures in the great outdoors.